Define your entryway with a narrow console table like the one below found here. By adding these amazing arched windows, a DIY pallet wall, tall vases and farmhouse style pillar candle holders you can complete the look below in no time! Bring a little rustic farmhouse garden inside with a shabby wooden ladder and some potted plants. (If you are a plant killer like me, check out our post on nearly indestructible houseplants. I have managed to keep a ponytail palm, a snake plant, and quite a few succulents alive for a few months now!) I have a tall ladder like this that is used as a nightstand next to my bed. I added boards running from front to back and use them to display decor items, and also as a place to hold my basket of remote controls, my phone and some books. I love using ladders as unexpected accent pieces! If you are having trouble finding the perfect ladder to use as an end table or nightstand, this ladder shelf in antique white is perfect! The Navage Patch is offering free farmhouse printables that would be perfect to print and frame on their own or used to create a gallery wall. If you don’t want to print your own, I am loving these farm implement patent prints! So cool! Every farmhouse living room needs a big, comfy upholstered chair, and Rachel Ashwell’s Mabel chair fits the bill. Each piece can be customized to your exact specifications, so matching your existing sofa and decor is easy, and also available in a love seat. The best part? This piece is Made in the USA. I love the casters on the front legs. Such a perfect detail! Bring a little rustic farmhouse into your home office with a DIY chicken wire memo board. This is adorable! If DIY is not your thing, this chicken wire memo board is the perfect size for any room and use. These little clothespins would work perfectly for this project. Using an antique dresser mirror, this all-white bathroom gets a rich pop of color that lends to a farmhouse look. I recently found an antique dresser mirror at Goodwill for $5, so start looking if this look appeals to you! I also love the corner shelves. What a great way to still have a pedestal sink, but add counter space, in a tiny bathroom! How cute is this rustic HONEY centerpiece box?! It is even made of reclaimed wood found in Texas. While you may think this is farmhouse decor that is more for spring or summer, I see it as being pretty versatile. The other side is probably not stamped “HONEY” and therefore this can be turned around and used on a buffet or mantle to hold fall and winter seasonal decorations. $30 for a piece that can be used year-round is a steal! Don’t leave the Dog 1 and Dog 2 out of your farmhouse design ideas! 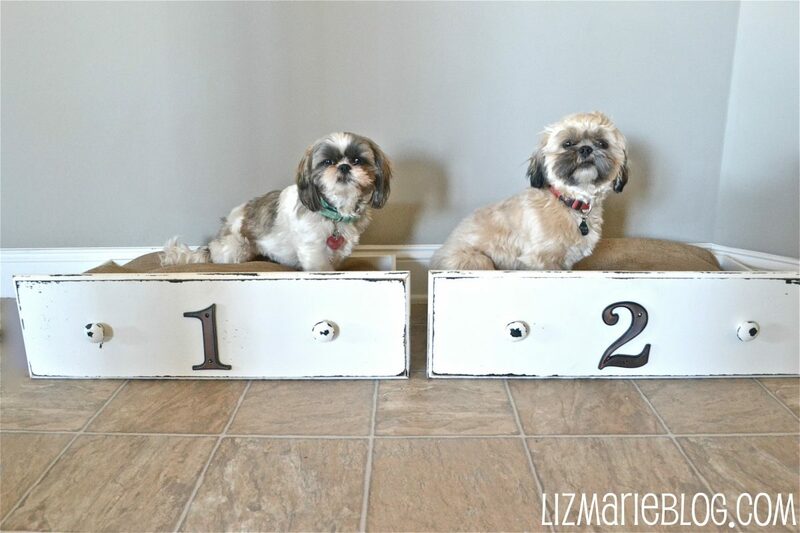 Check out these darling pet beds made from upcycled drawers at Liz Marie Blog. Or this rustic bed made from reclaimed pallet wood for your Perfect Pibble. I did promise not to surprise him with any more pets after the last dog…. I hope you enjoyed some new Farmhouse Decor ideas! There are so many ideas on Pinterest (thanks, Fixer Upper!) that I tried to find ideas that I haven’t seen before and also that I would love in my own home! I hope these inspire some new farmhouse decorating ideas for your home, too. I am so in love with that beautiful kitchen sink. I use big stock pots and that would just be so awesome! Those big sinks are definitely awesome for pots! 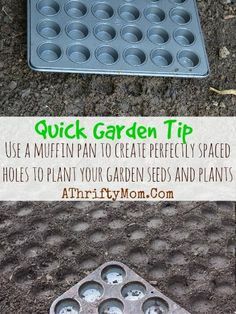 I love so many of these ideas! I’m slowly adding farmhouse decor to my home and these are perfect! Thank you! So am I! Re are renovating our 40 year old family cottage that was *very* mid-70’s when we bought it last year. We are slowly but surely redoing each room to be more farmhouse-cottage. It’s a lot of fun! There are so many cute things out there! I literally want Everything on this list! Awww… maybe someday. Me too! Especially the metal sign! I might just have to get it. I think it would be cute hanging on our shed above our little vegetable garden. That kitchen sink is beautiful!! I know! I totally want it! It is so pretty! I love everything about this post! From the shutter shelves to the step latter! I absolutely love the ladder display! I have something similar in our bedroom, but it’s not quite as perfect as this one! 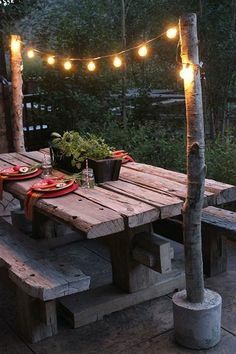 Make your garden that EXTRA bit inviting for the summer months with the addition of fairy lights! Here's some inspo on how you can add them to your garden design.